Last week, the Principalship hosted two special lunches for recipients of the Value Added Awards. These awards are given to BTC students nominated by their tutors for exceptional improvement on their course since the beginning of the academic year. 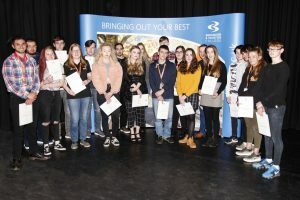 These students come from all three campuses and study a range of courses across the curriculum, from Land-based Studies to Creative Arts to Nuclear Engineering. Leon, Ashley, Rebecca, Sully, Kai, Sophie, Fraser, Craig, Bradley, Philip, Talitha, Alex, Thomas and Cameron. Kate, Lauren, Simon, Taylor, Lauren, Emily, Tyler, Ben, Damian, Enoch, Elysia, Jack, Kieran, Shannon, Marley, Georgeena, Ashdon, Matthew, Cameron, Martin and Elizabeth.